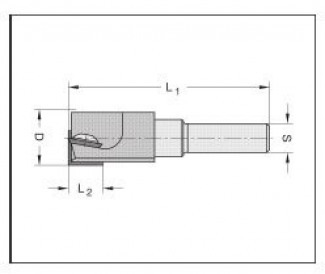 Single flute router bit, constant cutting circle. Mini reversible insert with abrasion resistance carbide grade. The insert has a cross-groove to insure perfect position and avoid any slipping during the cutting operation. 14mm diameter and above will ramp-plunge only. Diameters up to 1/2" can plunge straight down. For general routing operations such as grooving, jointing rebating in hardwood and various wood composite materials. 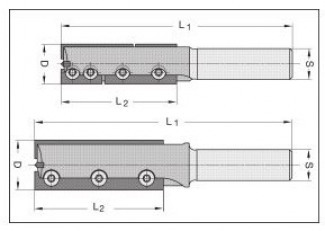 For high-wear applications, please select cutters with high-density body material, designated by "HD" following the part number. Two flute router bit with two straight, reversible solid carbide insert tips. 3-hole insert design, face screw fixing. 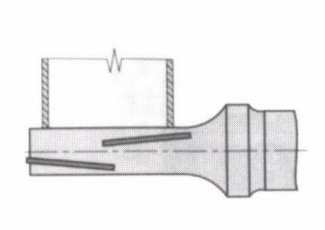 Bottom cutting for plunge capability. Right hand rotation. For jointing, trimming and rebating in solid wood and a multitude of composite panel products. Carbide Insert rebate cutter designed with one straight 4-sided insert knife cutting on the periphery and one insert (reversible) tip for plunge cutting. Shear angle to produce a clean cut on laminate or coated surfaces. For grooving and rebating. Especially suitable for shallow cuts in door production, such as hinge and lock pockets, face plates etc. Two flute router bit with two straight, reversible solid carbide insert tips. 16mm diameter with 28mm has a solid 28mm tip on each flute, the 45mm cut length has 2 staggered tips (16 and 28mm on each flute. Bottom and peripheral cutting. For general routing operations such as grooving, trimming, rebating in both solid wood and a multitude of wood composite materials. Well suited for plunging with reduced feed rate. Two flute compression style insert router bit with two solid carbide insert tips shearing downward and 2 inserts shearing upward. 4-sided plunge knife. Upper and lower inserts are interchangeable. Bottom and peripheral cutting. Right hand rotation. For chip free surface finish on laminated panel products, but can also be used on solid wood for jointing, trimming and sizing.